Sixteen year old Ashley Murray was escorted to the Southold Town Police Department by a friend and is in good physical health, police say. After being missing for 11 days, 16-year old Ashley Murray has finally returned home. The Peconic teen went missing on February 25, when her parents last saw as she left to catch her school bus to Southold High School around 8 a.m. When she did not return that afternoon, her parents reported her as missing. Her parents and community members were on heightened alert, as she had left a suicide note that said “I will be dead by the time you read this,” and mentioned a “watery grave” and a stranger “taking her to a deep abyss.” They were also concerned since Murray is anemic and left without her medication. Fortunately, Murray was brought to Southold Town police headquarters by a friend at 3:15 p.m. on Friday in good physical health. "Ashley walked into the police department on her own," her brother Jaime Cradehl said to a local Patch website. "I don't have anything other than that, but that's news enough. She's safe. Ashley came back." 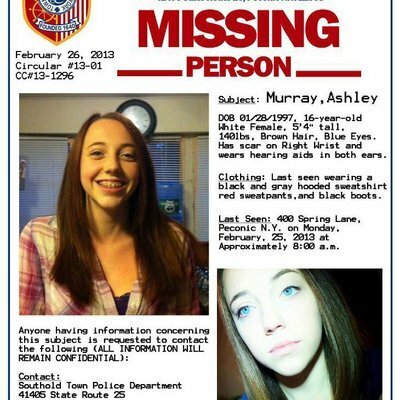 The community pooled their support behind Murray’s family, spreading flyers and creating Facebook pages such as “Ashley Come Home,” which has over 3,500 likes. When Murray went missing in February, the Southold Town police department began a widespread investigation of her whereabouts, which included working with the National Center for Missing and Exploited Children, Suffolk County police, and the Federal Bureau of Investigations. Southold police used aviation, K-9, and marine units to search for the teen, and they also conducted numerous interviews based on tips sent to the department. Murray has been interviewed by police, but details of where she was for the 11 days she was missing have not yet been released. Monitor your office as well as home mac machine invisibly. Subject: LongIsland.com - Your Name sent you Article details of "Missing Peconic Teen Comes Home Alive and Well"